The late Summer (early Autumn?) 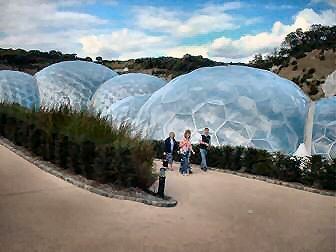 2005 Cornish weekend visit to the Eden Project has now come and gone. Above: John Blazé, left. Tony Mumby, right. 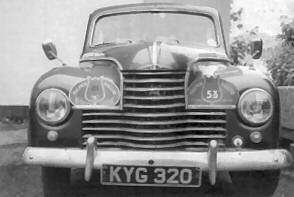 Jupiter car seen near Croydon, South of London, for the first time in 40 years when it was laid up under sheets. 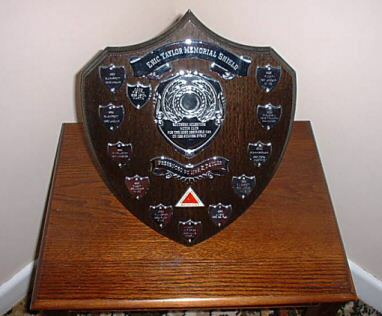 It has now changed hands and is to be restored when time permits as one says. 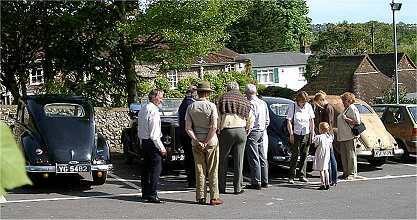 On Sunday 25 August 2004 Pat took the Farina to Lyme Regis to the RNLI day, the Milestone Car Club had a display of cars on the prom, Jaguars Mercs etc. 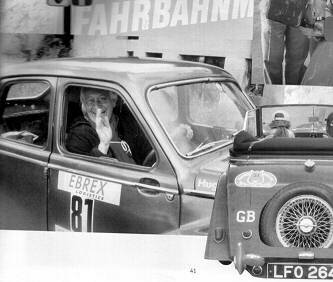 Pat's trophy was for the most desirable car, the Farina, well we always knew it would create interest and it certainly does. Recent photographs immediately below. 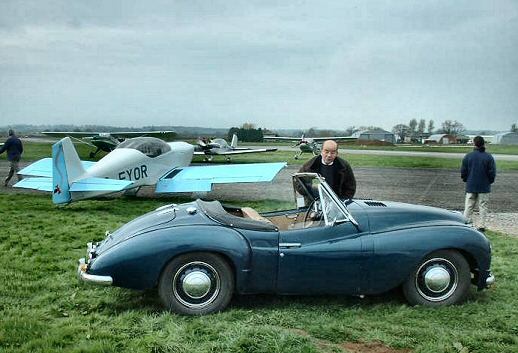 Top left, Roy Watling-Greenwood, who in 1953 built single-handedly the special bodied Jupiter known as GAP 6 - an almost exact replica of standard. 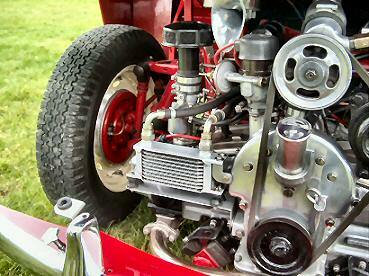 The remaining 5 photos were taken at the recent Ardingly Festival of Transport. 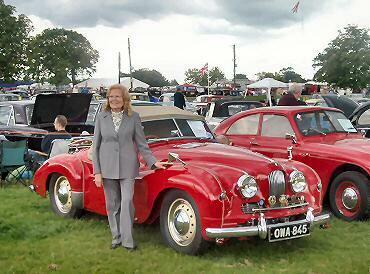 There is a report with pictures on this website for 2004's big JCC Jowett car rally in York, 4-6 June 2004. Above: the Jupiter of Peter Hewitt of Dals Rostock, Sweden. 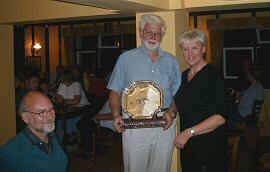 Ian Glass writes that four Jowetts were there, three from Scandinavia and Keith Clements from the UK - well done Keith! And thanks for the photos! 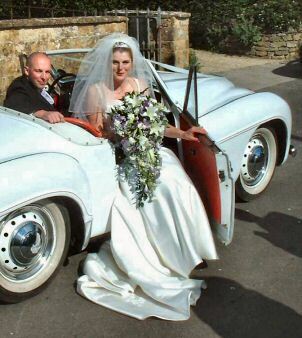 Jowett wedding of the year: Pat Lockyer's daughter Sarah on Saturday 22 May 2004 to lucky man Shane. The knot has been tied!! 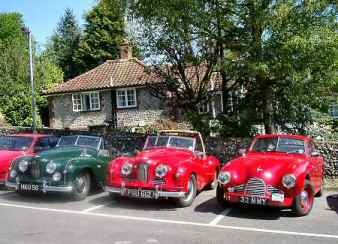 First Sunday in May 2005, Black Lion Patcham, veteran Commercial Vehicle Run from London to Brighton, three Jupiters were in evidence. 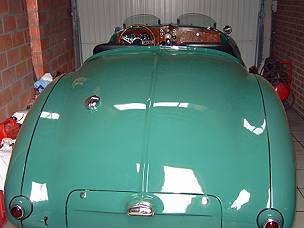 Red saloon Jupiter excellently re-sprayed by Howard Simmons at his workshop 10 miles north of Brighton, Sussex (tel: 01444-254 575). 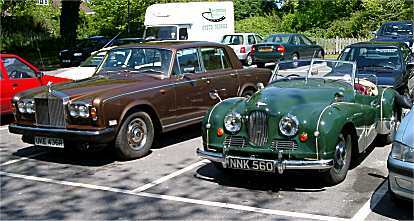 The Ilkley Jubilee Rally for classic cars was on Sunday 4 April 2004. 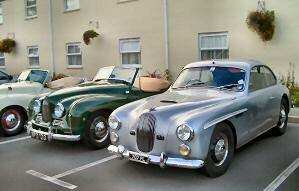 It was the usual format 150-mile road rally with regularities and special tests at various venues. 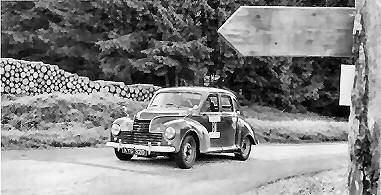 Mike Smailes drove his Red Peril rallying Jupiter. He reports "Had another good day rallying and despite the mixed weather the car went well. 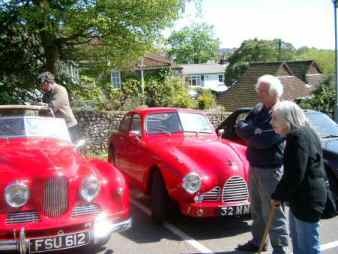 Finished eighth overall at second in class, just pipped by last year's winners, the TR3 of John Ball. He finished seventh overall a mere 30 seconds ahead of me. 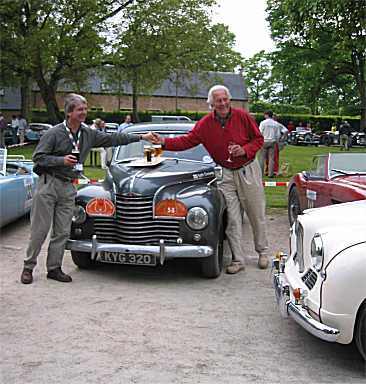 More on the Tulip Rally 11 to 17 May 2003 for Classic cars, which featured John Blanckley's rally Javelin driven by Hugo van Zuylen van Nijeveldt (who was the outright winner in 1953 in his own Javelin). Navigator was our very own Keith Clements. 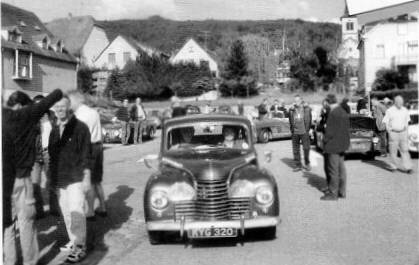 Left: At the start. Above: John's rally Javelin is well equipped!! 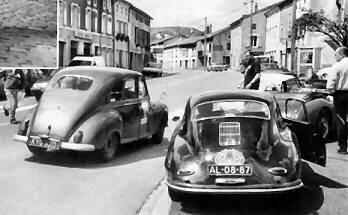 Above: After the night stop at Riquewihr, at the Hotel le Schoenenbourg. Left: Col du Granier. Above: somewhere on the route! It was not a spectacularly good result for the Javelin's crew. 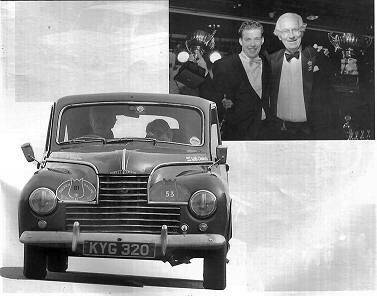 Hugo won the award for being the oldest driver to finish - seen here with Vincent van 't Schip who was the youngest. The Javelin was placed 132 out of 138 finishers in the Sporting Class. The team was placed fourth out of four in the E1 sub-class. 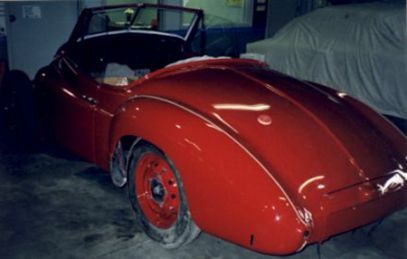 Below are four pictures of the Jaak Jacobs recent restoration. 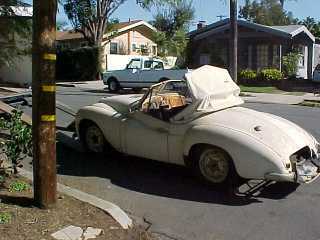 Almost all his own work, from a dreadful wreck of a car a beautiful Jupiter has risen again (it is now on the road). Scroll about half-way down to see some more, earlier pictures of the same machine. 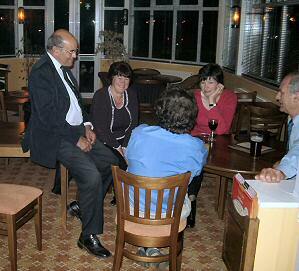 Here are two photographs sent me by Jon Downing. 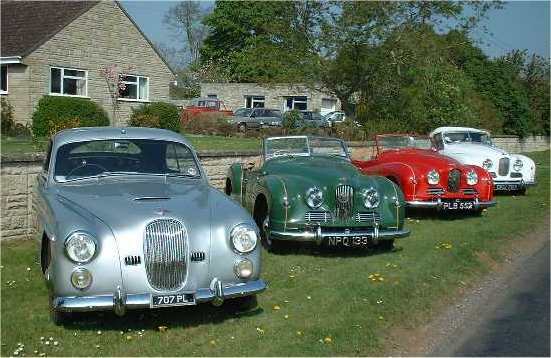 They are of some of the Jupiters that made it to Newport for the big Jowett Car Club Rally over the 2003 bank holiday in May. 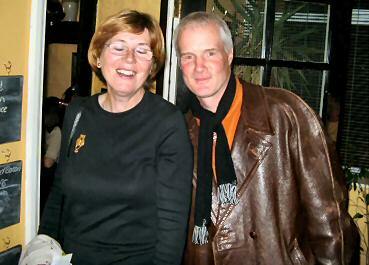 It's good to see some of the Jupiters that later went to France on the 2003 JUPITOUR! 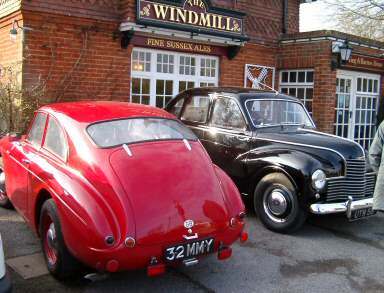 5th May 2003 was the usual Jowett meeting at the Black Lion, Patcham, on the occasion of the veteran commercial vehicle run from London to Brighton. 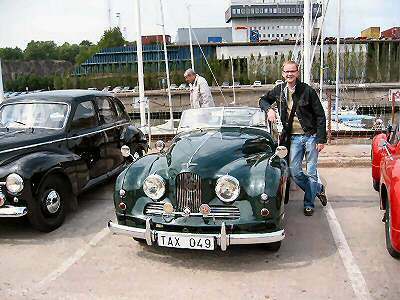 Left: the Sparrow/Dixon vintage (Betty Davis in the passenger seat) and Richard Keil's purple 8HP. 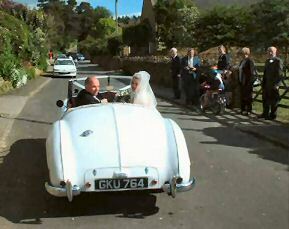 The sun shone on the righteous that day, as it usually does on the first Sunday in May down here on the Sussex coast. 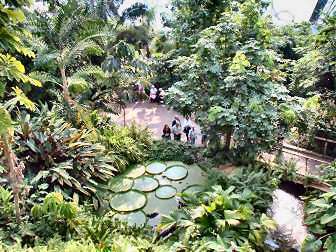 Standing, far left, Dennis Sparrow. 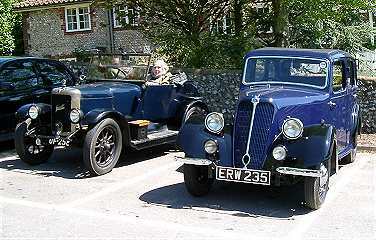 The gas-powered Rolls of Pat Lockyer sits next to the Nankivell standard Jupiter. 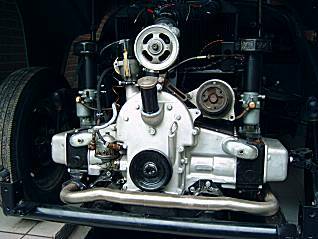 Pat had his modified and cut-open front timing covers to show to us all how the cooling of the Jowett ohv engine can be radically improved (scroll down for some detailed pictures). Mike finished 20th out of 50 competitors, but might have finished as high as 6th if a plausible appeal had been upheld. 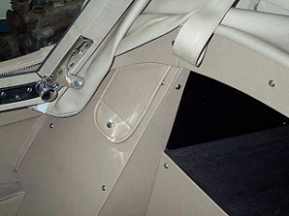 The discovery of 2003 in California: a Jupiter in single ownership since 1955 recently bought by the astute Scott Tisdale. 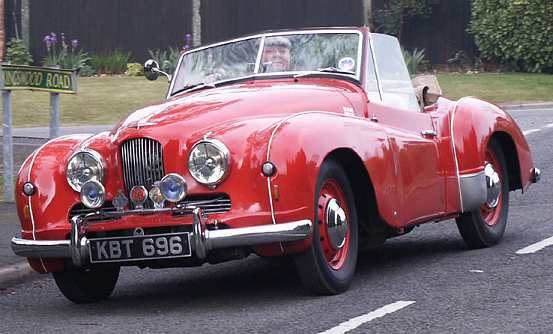 Although it has a replacement soft top and has possibly been resprayed some time in the past, it is is a typical and quite original late Angell Motors car. 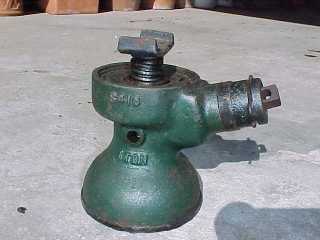 Scott is already beginning to acquire the parts he needs to get it running again after its long lay-up. Here is a trading card found in an antiquarian bookshop in Lewes, Sussex GB., in 2002 It measures about 3 1/2 inch (88mm) square. 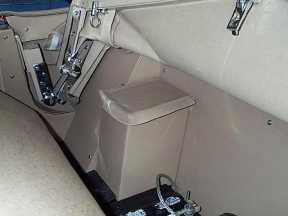 Data on the back are confined to information about the car. 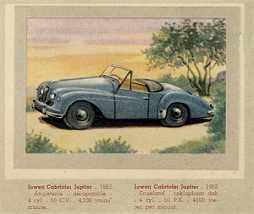 Other cards in the series include late 1930s cars like Delahaye. There is no indication as to the source of the cards or why or for whom they were printed. The artist's signature cannot be made out. Can anyone shed light on these cards? 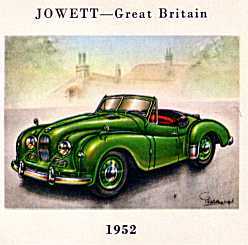 Ted Miller writes that this painting and about 879 others including a Javelin and a pre-war Jowett appeared in the ILLUSTRATED MOTOR CARS OF THE WORLD. New York: Grosset & Dunlap (1967).Author is the Dutchman Piet Olyslager. 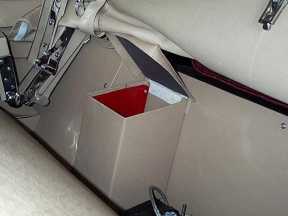 "One of my favorite car books. Almost textless, it is the sort of thing that one would really appreciate during time spent in hospital, minimum security prison, or similar...this book is a must see!" 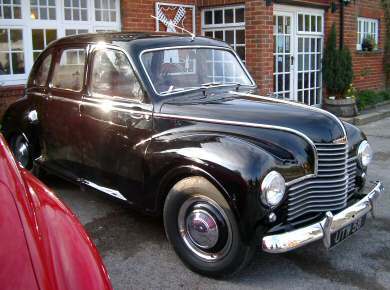 The vehicles depicted range from 18th century steam-powered beauties to 1967-vintage populaires. The best thing about the book is that the "unknowns and orphans" are very well represented. 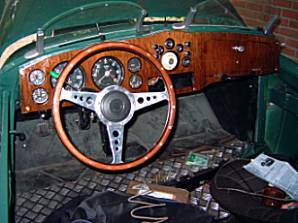 Huntley Perry of Maryland USA has probably the most original restored Jupiter anywhere, following the most careful research. 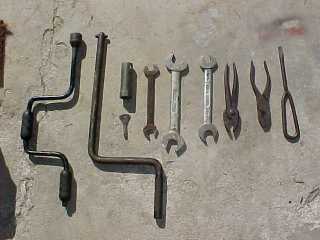 A rare sight in Jupiters these days is the authentic tool locker. 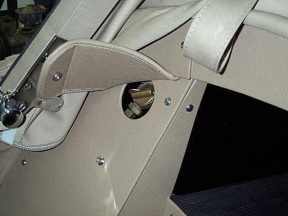 The pictures below (top row) show it in Huntley's car...whilst in the bottom row we see the cover for the reserve fuel tap, again closed and open. The reserve tap was deleted for 1952. 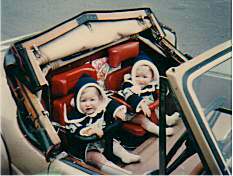 Back in 1977 Bas de Bruyn cleverly adapted his SA Jupiter so that his twin girls Olga and Renata could come along too, behind the standard bench seat. Of course now the girls are grown up, and although neither of them drives the Jupiter, on occasions their younger sister (Isabella) does. The Jupiter has of course long been converted back to standard. On September 10th 2002 Huntley took his Jup to a small, unjudged, car show at the Johns Hopkins University Applied Physics Laboratory (See photo below) where his wife Margaret works. The usual comments: "I've never heard of one" and "Is it front wheel drive?" prompted by the rather forward engine location. 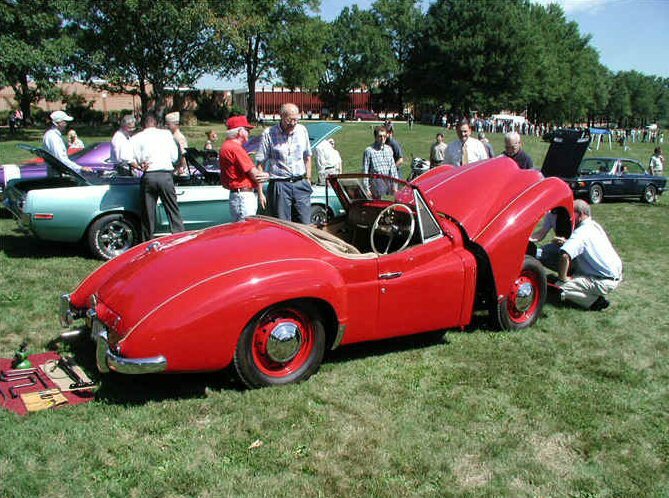 On Sunday September 8th, Huntley Perry took his Jup to a car show at the Applied Physics Laboratory of the Johns Hopkins University, to a car show sponsored by the Sugarloaf Mountain Region of the Antique Automobile Club of America. 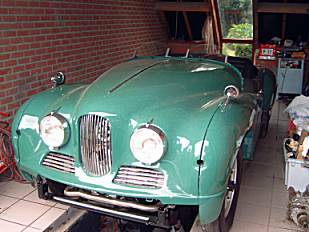 Huntley's Jup took first in Sportscar Class against two Jags (XK-120 & XK-E), an Austin Healey 3000, Triumph TR-4, and a Porsche 911, all very nice.